Well, here we are, the home stretch to Christmas. Are you all done shopping, wrapping, decorating and baking....wait, better not answer that question, because I'm not and it would be too depressing to know I'll be the only one on Christmas Eve looking for an open store. I'll tell you Santa, all I want for Christmas is December 26th...I've been a good girl, I promise. So last week I had asked if you all would share some of your Christmas traditions, but I see that you are a little shy. Except for Jerry Maxwell, who did share a Christmas tradition, and it sounds wonderful, I'm going to share it with you all, THANK YOU JERRY!!!! My good times were when my kids were young. We would fire up the old green truck and go to the Christmas tree farm on North San Dimas Ave. We would all circulate through out the farm selecting what each thought was the best tree. Then we would go vote on each selection until we concluded which was the best tree. Then we would cut it down and put it in the truck. We took it home and washed it down. Once dry, we put it it the house and had a decoration party. All good memories. So now I'd like to give you all another opportunity to share a little, with January 1st looming I think it would be fun to share our New Years resolutions. And, of course, I'll start. My resolution for 2012 is to spend more time with family; with my daily life being so busy the days blend into weeks, and then months, and before you know it a year has gone by. It was pretty sad when my sister texted me the other day and I then realized that I have seen or talked to her since my daughters wedding in July, OMG!!!! Now what do you all resolve to do (or not do)? I'll share them with you in my Jan 4th newsletter. Now, don't worry, when the new year gets going I'll also be back to give you the upcoming shows and events, but I would like to give a "save-the-date" that you just don't want to miss. The weekend of Jan 28th & 29th is one of the biggest events of the year, the 7th Annual Grand Daddy "Drive-In" at the Grand National Roadster Show at the Fairplex in Pomona. 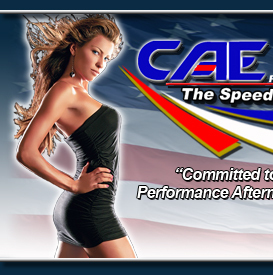 I'll be giving you all of the details in my next newsletter, but for more info on shows coming up in January you can go to our website at www.caeperformance.com and click on EVENTS. And I will be posting upcoming things on our facebook page as well so be sure to become friends with us, just search TAMIE RED and send a request. We here at The Speed Shop would like to wish you all a Merry Christmas, filled with lots of family, friends, food and fun.